If your recess isn’t deep enough to accommodate an inside mount, you will have to choose an outside mount using an outside mount using the Camber Deco frame. Another reason for choosing an outside mount would be windows that open or tilt inwards. As with an inside mount, simply measure the width and height in three places and add to this the width of the frame (67mm x 2 = 134mm). So for example if your window opening is 1000mm, the dimension you enter into the online designer is 1134. Ensure you have 67mm of wall space each side of your window to accommodate the frame. 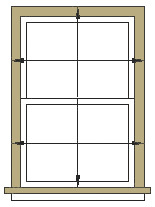 Measure the height in three places, left, centre and right and add just 67mm if the frame is on the top only. The dimensions you provide us with for outside mount shutters will be the dimensions of the shutters and frames you receive. We will not make any additions or reductions. The frame is fitted to the face of the wall through the channel in the front and the screw heads are then concealed by fitting the cover strip into the channel. 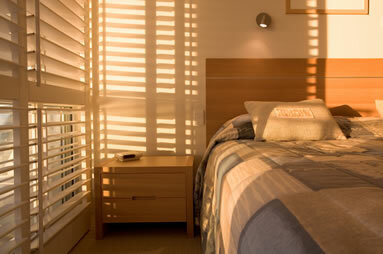 The shutter panels, when opened, will fold back 180 degrees against the wall.